"You'll change your mind someday." "You'll regret it when your old." "Don't you want a little mini version of yourself?" These are all common phrases I hear when I tell people I do not plan on having children. I'm 20 years old and I'm not sure if this is too soon or not soon enough to be thinking about that portion of my life. 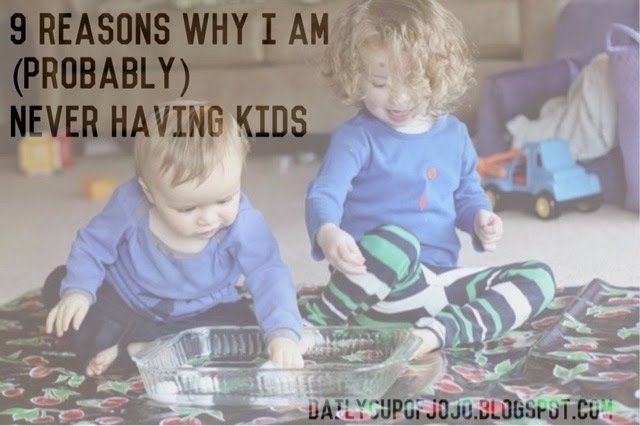 I really don't think its anyone's business as to why I choose not to have kids. People who do have kids are never questioned like this. "You'll change your mind someday, but by then you can't go back"
"You'll miss out. Kids are a drag." "You don't want a little mini version of yourself." But for the sake of my sanity I'm listing out my reasons as to why having kids sounds like a bad idea for me, personally. Kids are expensive. Did you know a child, in ONE year, can cost up to $15k just for BASIC necessities? That's $207,000 just on the essentials for 18 years. And then I have to send them to college?! Do they accept organs, because that'll be my only bargaining ticket for any university. When I'm old I want to be able to spend the money I didn't spend on summer camp or braces. I'll be in Italy while your little Jenny practices the trumpet in the middle of the woods. The obnoxious stage lasts far too long for my liking. I don't like the baby stage at all. Toddlers are alright in small doses but when they start developing attitudes I'll say Sayorana suckers. I cant handle all of the questions and constant attention. Maybe if children came out at about 8 years old, I'd reconsider a couple of these factors but, eh, they don't . I cannot braid hair. My daughter (or son, if hes into that) would seriously be screwed out of elementary hairstyles. I can;t even touch a brush without a knot already forming in my hair. Why would I put that omen on my kids? I want to have a career. I am young, and free, and all I want right now is a path to success. If I have a baby one of the two of us will have to give up some major aspects of our life. As much as I don't want a baby, I would rather I have a baby then someone send their kid to a nanny for 12 years of their life. Parents should be raising their own kids. If you want them so bad, take care of them yourself. I. Like. Sleep. The proper amount of Zzzz's are important to me. If I stay up late then I want to be able to sleep the full night without some messy kid climbing into my bed or a crying baby whimpering about the mess they made in their pants. I thrive on sleep. Disturb my sleep, you disturb my day. Fear. There's a little bit of fear there that I would not be a good mother or my child will go off the deep-end. I'm not a nurturing person and I can be pretty selfish at times as well. This is probably a good indicator that I shouldn't be parenting in the first place. And what happens if I totally screw up? I like to hang with my friends babies that way I can get my cuteness fulfillment with out an entire commitment for 18 years. I'm doing society a service, almost a favor actually. Last time you went to a movie, restaurant, or even a church service do you remember a screaming kid? I sure as heck do. We don't need any more of that in the world. Plus, if that were me I would be mortified and I'd never take my kids out in public anymore. So many families have multiple kids that, the way I see it, I don't need to have any because they had it for me. Round of a applause for the families with multiple kids. I don't need children in my life to find happiness or the meaning of life. I'm perfectly fine doing everything on my own or my future husband on my side. I don't mind being the chic little couple in the penthouse upstairs (I've been watching too much Gossip Girl). Thanks to those who see my desires to do other things in my life aside from having children. Maybe i'll consider starting off with a dog and see how that goes, but for now, no kids.